It’s becoming repetitive, but no one’s complaining. 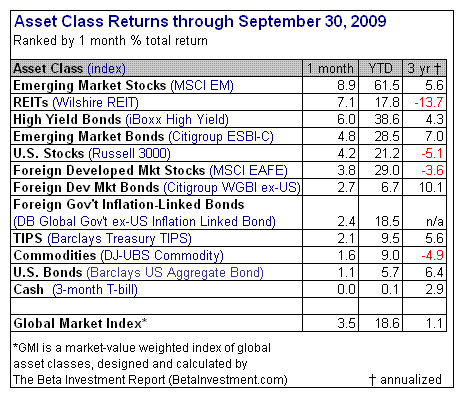 September witnessed across-the-board gains in all the major asset classes. Again. With some minor exceptions, the world’s capital and commodity markets have been on a non-stop rebound since March. That’s not exactly surprising, given the depth of the previous losses in almost everything. When you stretch returns to extremes in a short period, a reversal in the opposite direction is typical. Deciding how long it will last is the trick. In sum, the good times can’t last, at least not in terms of tidy gains as far as the eye can see. There’s a reason that diversifying across asset classes has merit, even if it’s not obvious these days. But correlations among the various subgroups of stocks, bonds, REITs and commodities are destined for a wider divergence. Designing and managing portfolios, as a result, will become more challenging in the years ahead. But not today. For the moment, everyone’s a winner regardless of asset allocation. Enjoy it while it lasts.